The big red dog is back. 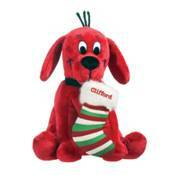 Courtesy of Douglas Company, as they expand their new Clifford line with a Holiday themed addition for Christmas 2012. You better not pout, but you’ll very likely shout when you see that Holiday Clifford is coming to town for the holiday season. Plush toy maker and lifestyle gift creator, Douglas Company, introduced Clifford the Big Red Dog® early this year, and now they are bringing out the newest holiday plush version. A pair of the limited edition dolls will be released this September- and don't worry, they'll fit in the house. The first stands 7" tall and holds a red, green, and white stocking in his mouth as seen above. The second Cliff is a bit taller at 11" and comes wrapped in a cute little red, white, and green scarf. The two little guys will sell for $11.99 and $21.99 respectively when they make retail shelves their (temporary) homes next month. And for those prices, fans of Big Red might as well make their own Cliff-pack and get one of each!